I’m about half done with this, and just wanted to give an update to those people I know who are awaiting it. I’m ditching the multiple-plugin thing. Too many complaints and too much confusion. Also, the plugin directory and updaters don’t support it well. So 1.0 will have a checkbox area where you can select the pieces you want instead. Login works. Register needs some more work. Automatic publishing now works for both Fan Pages and Applications! I just worked out how to make Application posts through the Graph API properly. Manual publishing isn’t quite there yet. Widgets are largely unchanged, but will all be rolled into one sub-module. Fan box got replaced by the Like box, which is the same thing with a different name. So I’m going to keep calling it the Fan Box in the interface. The bookmark widget is going away, because it doesn’t work properly anymore anyway. New widgets for the Facebook Social Plugins are working. Like and Share will remain unchanged, although the Like now uses the XFBML to do its thing. Doesn’t really make a whole heck of a lot of difference, though. Comments pull-back from Facebook is possible. I know how to do it. I’m debating whether or not to turn them into “full-fledged” comments or just display them separately. Comments push *to* Facebook is also possible. Meaning that if somebody leaves a comment using FB and clicks the share checkbox, it will send it to Facebook (no popup) and also include the text of their comment (or an excerpt, at least). This is not done yet, but it’s actually quite easy to add now. All dependence on the FB-Connect library will be gone. Ditto for their PHP library. I’m writing this with pure calls to the Graph API and XFBML. PHP 5 is still required, and there’s still an activation check for that. One last thing: Upgrading from old versions to the new one will be a hassle. Things will just stop working properly when you upgrade. Can’t be helped. So I recommend deactivating SFC and all sub-plugins entirely before upgrading, then reactivating it afterwards. There will be a note to this effect on the WP plugins screen. Update: Since writing this, Facebook has altered the look of the Application Settings page. Now there’s only two major settings that you need to set, and they’re both on the Web Site tab: The Site URL and the Site Domain. Set those correctly and your App will work with SFC. Set them incorrectly, and it will not. So, much simpler, really. After creating your application, you’ll need to visit the Apps section in the Facebook Developer Home area. Here you’ll find your application, and the all critical “Edit Settings” link. Firstly, never give out your Application Secret. If you give this out by accident, then use the Reset Secret Key link to get a new one. Obviously, you want the name of your Application to make sense. I suggest using the same name as your website. You can even use your domain name here if you like. Just be aware that this name is what the Fans of your site will see in their Applications area. The Basic Information section is important as well, fill it in as you see fit. I also recommend uploading good icons and/or logos for your site. Gives it that finished look. Contact Information is obviously important as well, but don’t worry about all those extra URLs. They really apply more to Canvas apps. Of course, if you want to make special pages on your site for them and provide the URLs here, feel free. The Authentication Settings page is surprisingly important. Those top two boxes need to be unchecked for a Facebook Connect application. Why? Because when they are unchecked, your Application becomes an “External Website” as far as Facebook is concerned. If you have either them checked, then your app’s Canvas section becomes active and you might have users trying to add it to their profiles and such, resulting in broken pages and a general bad user experience. The Connect Settings page is probably the most important one. These settings must be filled in and they must be absolutely accurate. Specifically, the URLs must be the URLs that are actually used by your site. Capitalization matters. The leading “www” or lack of one matters. Whatever the URL your site is in the browser is what you MUST put into these fields. Anything less and your site will not work. The Advanced Settings screen contains these three fields which you need to set in the same way I did. The email domain no longer exists, however. They removed that in favor of a different approach, so you can ignore that field. Finally, after you have saved those settings, take the time to go back to the main application screen and click the “Edit Application Profile” link. You’ll be taken here, where you can set up the “look” of your application page on Facebook. This includes what tabs are visible, the stuff in the Info section, etc. You can add extra Applications tabs to this page and generally customize all sorts of stuff. None of that affects your site, but it does affect how the App Page looks in Facebook. The more polished it is, the more likely people will “Fan” your Application. And Fans get updates from when you publish posts to the Wall. Great way to drive traffic to your content. Hope this helps! Mainly, I hope this reduces the number of questions I get about this process. Enjoy SFC! For those of you helping me with testing out SFC trunk, there’s a new one in there for you. The activity feed widget is one of Facebook’s recent addition to their social widgets. Basically, it shows who’s liked and shared your posts recently. The idea is to encourage liking, I suppose. The latest plugin adds this to WordPress as a sidebar widget, as a shortcode (fb-activity), and enables it for direct theme usage with the sfc_activity_feed() function. As always, this is trunk beta code here, so if you do use it, don’t expect it to be 100% yet. Still, it works well enough. I sort of snuck this into Simple Facebook Connect 0.18 for you all. 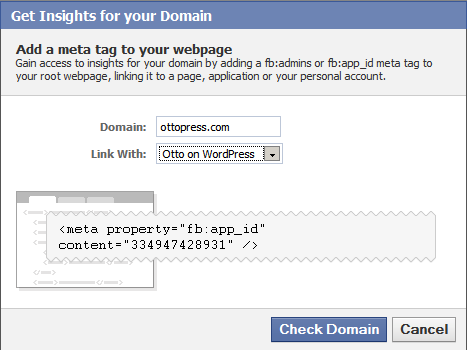 If you go to http://facebook.com/insights, then one of the new things they have is “Insights for your Domain”. Basically, this lets you hook the Facebook Insights system up to your own domain. They give you meta info to add to your site so as to define who has control over that site. This lets them know who should be able to see the insights and such. Well, if you use SFC, that information is already there for you. Just go over to the insights page, put in your domain, then “Link With” your SFC Application. 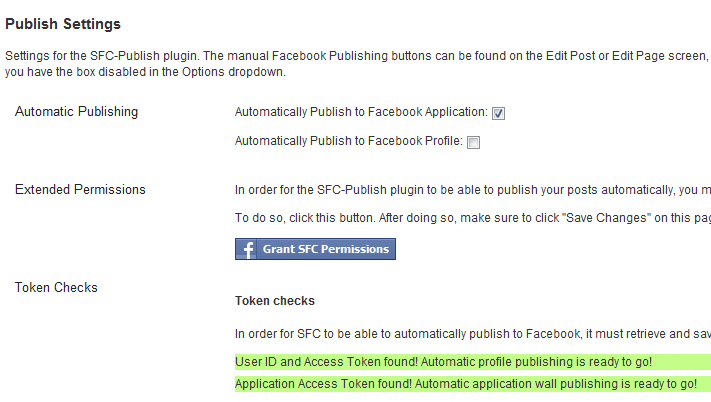 No need to add anything else to your site, the base SFC plugin is adding that fb:app-id meta tag for you automatically (once you’ve configured SFC itself, of course). Note that you may have to link it a few times before it actually takes. Facebook has to retrieve your webpage to verify the connection, and it seems to time out rather easily. Took me several tries and I kept getting messages like “Bad Domain” and such. But it finally worked. Since I just added it, I don’t have any data yet to show you, but basically it will keep track of the “Shares” from your site, so those Share buttons will now give you some useful information and feedback on the Insights page. Plugin Programming Tip: Your Users Don't Read. Over on my Simple Facebook Connect page, there’s lots of comments from users with problems. Having answered these for a while now, via there and via email, I’ve come to the conclusion that people don’t search for answers to their problems. The “How to fix the Email Domain” problem is answered on that one page no less than 6 times, for example. Almost all the rest of the problems given come from the “wrong connect URL setup” issue. So if you don’t want to do support all the time, I think you have to make your plugin smarter. Take the most common issues you see and make the plugin auto-detect the problems. That’s what I’ve done with SFC version 0.16, for example. Error messages now show up when the user configured something wrong on Facebook. The plugin now can detect these two major causes of problems and will display an error message. It also provides a link to the right place on Facebook to go and correct these problems. It can’t actually fix the problems directly (though that is possible… small steps), but I hope this will eliminate the need for me to continually have to answer the same questions over and over again. So my tip for the day for plugin programmers: For robustness, make your plugin check for commonplace issues. And the issues that you think will be commonplace may not be the ones you expect, so figure on having to add more and more checks every time. If you subscribe to the Twitter account that is hooked up to my blog entries, then you might have saw a test tweet earlier. That’s because I was testing. Now I’m not, and I just pushed Simple Twitter Connect 0.5 out for release. – Made the comments plugin smarter. The Settings page allows the “Send to Twitter” button on comments to be disabled. Just leave the field blank and voila, no more checkbox. – And the big one: Automatic Tweeting on Post Publish. It supports auto-tweeting to an alternate Twitter account than your own (useful if you have a multi-user blog). Manual publishing will be coming soon, but I suspect it will not support the alternate account functionality, for simplicity. It would be confusing and hard to use.